The old comic-book adverts were something of a phenomenon that many have fond memories of. They instilled a sense of wonder in the kids that fell under their spell, and even though what they received through the post fell way short of their expectations, they still sent off for more. Ad agencies today can only drool at the way these small ads captured the imagination of the young, knowing they could never get away with anything like that now, not without spending some time in prison. In this artwork, I've created a fictional company called WIZBANG! as usually these small ads were from the same company who used different names. 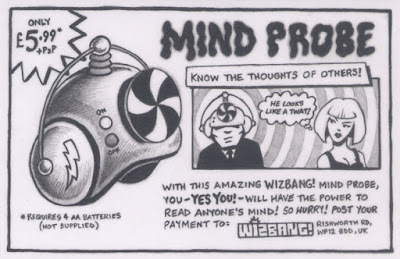 In this case, it's a strange company that creates genuine items like the mind probe and sells them cheaply. And just a note: Don't send any money to the address in the ad, unless you're really stupid, because I doubt you'll receive anything back. If you do, it won't be what you expect. Pretty much like the original comic-book ads themselves! 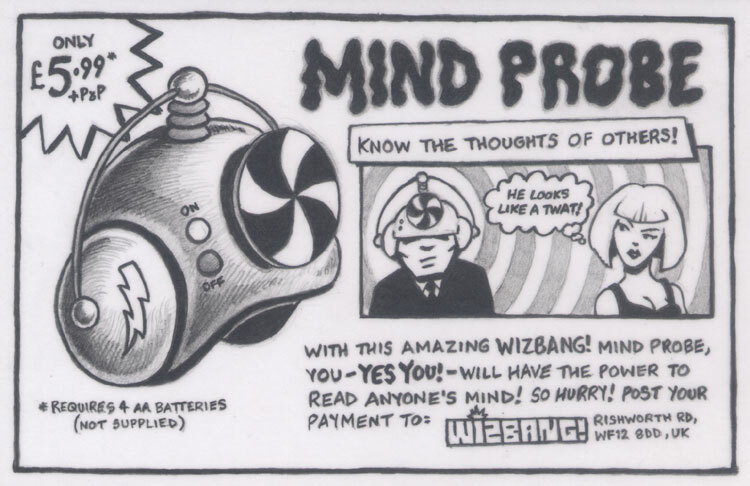 Artwork labels: advert, art, comic book, mind, pencil, post card, probe, skav, small ad, wizbang, wizbang!